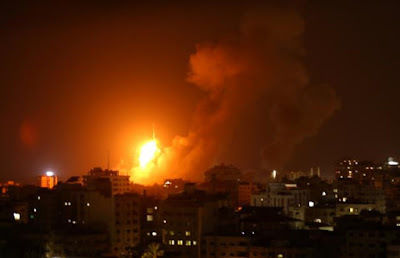 Gaza militants fired rockets into Israel and the Israeli military responded with air strikes on Wednesday despite talk from both sides of progress toward a possible truce to avert a fourth war in a decade. A senior member of Hamas, the Palestinian Islamist group that controls Gaza, said talks mediated by the United Nations and Egypt on a deal to tamp down tensions were in “advanced stages”. The Israeli army said Wednesday’s violence began with militants firing guns at an Israeli engineering vehicle, and Israeli troops responding with tank fire. One Israeli was hurt by the rockets, rescue services said. One Hamas militant was killed and two others were wounded in the Israeli air strike, Palestinian officials said. Five civilians were also injured. “I am deeply alarmed by the recent escalation of violence between Gaza and Israel, and particularly by today’s multiple rockets fired toward communities in southern Israel,” said U.N. Middle East envoy Nickolay Mladenov. Gaza has been controlled by Hamas for more than a decade, during which time it has fought three wars against Israel, most recently in 2014. Along with Egypt, Israel maintains a blockade that has brought the territory’s economy to a state of collapse. Around two million people live in Gaza, mainly stateless descendants of Palestinians who fled or were driven out of what is now Israel at its founding in 1948. Gazans have held weekly protests against Israel at camps on the border since March 30, some of which have become violent. The Israeli army has killed at least 158 Palestinians during those protests, and a Gaza sniper killed an Israeli soldier. Neither Hamas nor Israel appears keen on another full-blown conflict. Public demands by both sides for the other to release detainees appear to have been a stumbling block in securing a long-term truce. Avi Dichter, head of the Israeli parliament’s foreign affairs and defense committee, struck a cautiously upbeat note on Wednesday. “I very much hope that we are on the brink of a new day on the matter of Gaza,” he told reporters. Prime Minister Benjamin Netanyahu called off a trip to Colombia this week to attend to the Gaza truce talks and was due to meet with security chiefs for late-night consultations. In return for calm in Gaza, Israeli officials said on Sunday they would reopen a commercial border terminal that had been shuttered in response to damage caused by fires set by burning Palestinian kites and balloons lofted over the frontier. They would also expand a Palestinian fishing zone. In exchange for any truce, Israel wants to recover the bodies of two soldiers killed in Gaza and gain freedom for two of its civilians who wandered into the enclave. For its part, Hamas demands that Israel free Palestinian security prisoners - a proposal that Netanyahu’s far-right coalition partners balk at. “We want to free our brave prisoners and we have no objection to beginning now,” Hayya said.